first ever outdoor skating rink! VivoCity has upped the ante on festive celebrations this Christmas. Check off your festive shopping list during our Black Friday sales, as well as Late Night Shopping event where we extend mall hours till 2am. A unique Christmas experience also awaits at their very first outdoor skating rink at the Plaza! 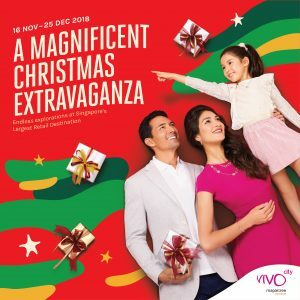 Gift-shopping and preparations for parties will be effortless this season as VivoCity holds a 3-day Black Friday sale from 23 to 25 November, and extend hours on 21 December till 2am for Late Night Shopping. Shoppers joining in the late night fun can also look forward to live performances, games, roving acts and free cotton candy for the little ones! 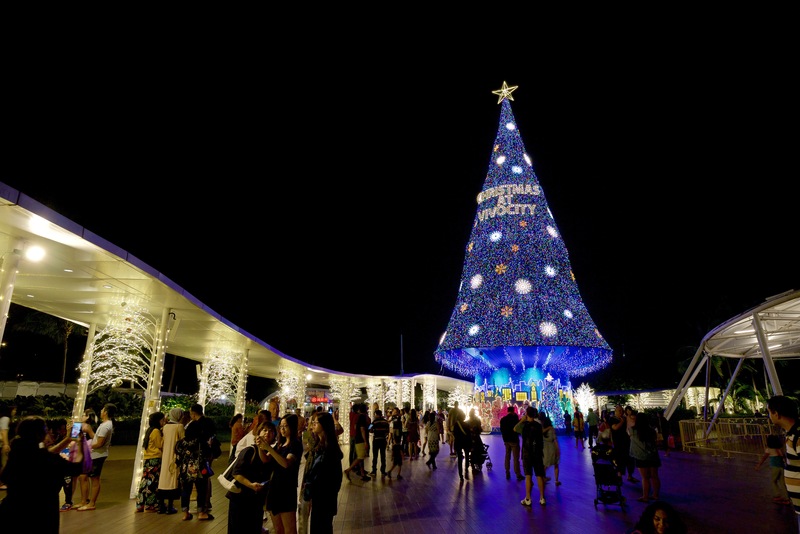 Delight in VivoCity’s late night festive buzz! Be entertained by exciting performances and games while you soak in the holiday shopping vibes with over 100 participating stores and exclusive promotions that get better with every hour! Oh and don’t forget to wish Santa a big “Merry Christmas!” when you spot him while shopping – he will be handing out gifts to those who are nice on his surprise hourly appearances! After the fun and games are over, wrap up your big night out with a comfortable ride home in a Grab vehicle right to your doorstep. Simply spend a min. of $250* to redeem a $10 Grab promo code between 10pm and 2am. *Maximum 3 combined same-day receipts. Limited to the first 200 redemptions. For more information, visit www.vivocity.com.sg/latenightshopping. It’s one of the biggest sale events of the year – Black Friday! From 30% off storewide at Esprit and 50% off their kids range at Cotton On Kids to buy 1 get 1 free jeans at Levi’s, come shop till you drop at our Black Friday weekend sales with irresistible deals from over 80 of your favourite brands. Need help with your bags of shopping? Be among the first 600 shoppers to spend a min. of $150* during the 3-day sale to redeem a $5 Grab promo code for a fuss-free ride home with your shopping haul! *Maximum 3 combined same-day receipts. Full list of participating stores can be found at www.vivocity.com.sg/blackfriday. Don your skates at our first ever outdoor skating rink for a fun night out with family and friends! Look out for special themed nights every week and gather your loved ones to create precious memories under the moonlight this Christmas. VivoCity Kids Club members get to enjoy one complimentary 30-minute session each*! Tickets go on sale at vivoskating.peatix.com from 16 November 2018 at $12 each for off-peak sessions, $14 for peak sessions and $2 for viewing gallery passes. Stay tuned for more announcements to follow. *Each session lasts 30 minutes. Visit any Customer Service Counter for the booking of VivoCity Kids Club complimentary sessions. Other conditions apply. More goodies await when you shop at VivoCity this festive season! Simply spend a min. of $250* to redeem a $10 Mapletree voucher! *Max. 3 combined same-day receipts. Redemption is limited to the first 150 shoppers daily on weekdays, first 250 daily on weekends and public holidays, and additional first 200 shoppers from 8pm on 21 December 2018. Other conditions apply. 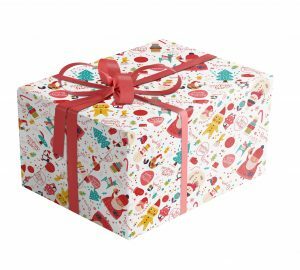 Sign, seal and deliver your Christmas gifts with our exclusively-designed Christmas gift wrappers and sticker gift tags, redeemable with a min. spend of $80*. *Max. 2 combined same-day receipts. Redemption is limited to the first 250 shoppers daily on weekdays and first 500 daily on weekends and public holidays. Other conditions apply. 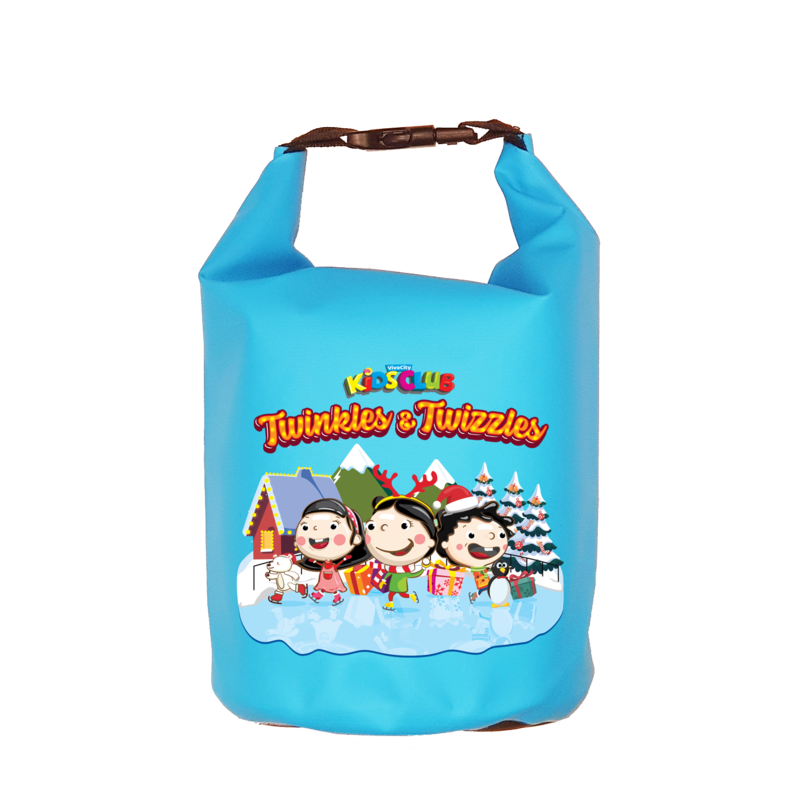 Keep your kids’ belongings dry while they have a splashing good time this Christmas! 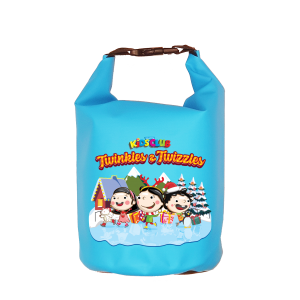 Redeem our exclusive VivoCity Kids Club 2-litre Waterproof Bag when you spend a min. of $60* at any qualifying store. Visit www.vivocity.com.sg/KCstores for full list of qualifying stores. *Max. 3 combined same-day receipts. Redemption is limited to the first 400 members. Other conditions apply. Share the love this season and contribute to charity while getting your gifts wrapped by the volunteers from Love for a Dollar. Simply head over to our booth located across the Customer Service Counter on Level 1 and make a minimum donation of $1* to enjoy the gift-wrapping service. All funds raised will go to Care Community Services Society. *Min. $1 per gift wrap. Comes with 2 ribbons per donation, while stocks last. Other conditions apply. Watch as our 107-ft Christmas tree lights up the sky every night at our Sky Park to your favourite Christmas tunes! While you’re there, remember to pose for a picture or two with our interactive Christmas set pieces for a fun-filled evening! Keep your eyes peeled for Santa Claus and his Santarinas as they make their way around the mall. Take a festive Insta-worthy shot with them and enjoy sweet treats for the kids!